I met one driver in my driveway today. I looked at his brown truck and the package in his hand. As the truck rolled away after a textbook perfect goodbye, the words ‘job security’ started me thinking. With the recent news of a high-ranking political attorney being sentenced to three years in jail and the ramifications of this continue to play out, I think pastors like me have job security because there will always be a need to speak to the positive nature of God when so much negativity happens so regularly. Let’s not limit job security to pastors and delivery men and women, however. We can all be in this delivery business. We may not have a truck, an abundance of dog treats, or a paycheck coming to us every two weeks (I know…bummer), but we who love Jesus have work—a lot of work—to do, especially now. More than sporting a “Jesus is the Reason for the Season” magnet on your vehicle, volunteering to costume the kids in the church pageant this year, or even saying ‘yes’ to that big solo during the music time at the Christmas Eve service, I’m talking about delivering Christmas to houses that may not have Christmas. The houses and families I am talking about may have the outward appearance of Christmas. A tree, lights, and maybe a star secured to a high part of the roof may be seen, but the household—and you’re getting what I mean now—doesn’t have Christmas. Instead, it is a red and green event. Ho. Ho. Hum. 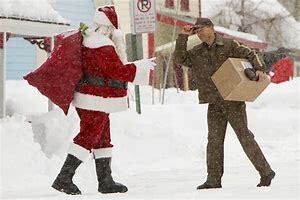 Yes, with or without a delivery truck, a package in your hand, or 22 years of professional experience, deliver Christmas this year. This blog was first published in The Independent on December 19, 2018.